This is for all of you out there in Heroesland who were unfamiliar with Joe Kubert and did not understand the importance of his his place in comic’s history or the importance of his (and other’s) stature in the history of our beloved medium. There is nothing to be ashamed of–comics has a long rich history and it is hard to get involved in comics’ past when the present is moving so quickly toward the future. Now, I love comic books and there is only one thing I love more than Comic Books (besides my wife, daughter, and those fresh Harris Teeter donuts with the sprinkles) and that is Books about Comics. I am a Comic Lit junkie and I try to read every book that gets published about Comic History and Comics Analysis. And there is a lot out there. Some of it is OK, some of it is good and some of it is great. Most books are for the experienced Comic Enthusiast but sometimes a book is published for fans who are new to our rich history. 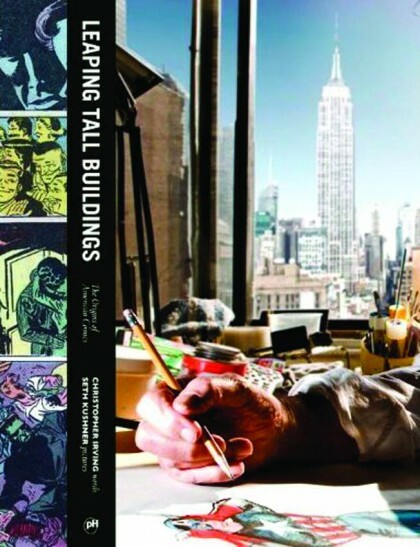 And Leaping Tall Buildings: The Origins of American Comics by writer Christopher Irving and photographer Seth Kushner is an ideal place for the initiate to annoint themselves in the rich history of Comic book past. In all honesty, the book is really a Photography Portrait album peppered with quite a few fascinating quotes from the creators themselves.